SBI CLERK NOTIFICATION, SBI Clerk Recruitment 2019 - 8593 SBI Clerk vacancies Application form, Eligibility, Dates at www.sbi.co.in. State Bank of IndiaSTATE BANK OF INDIA CENTRAL RECRUITMENT & PROMOTION DEPARTMENT, CORPORATE CENTRE, MUMBAI, Phone: 022-2282 0427; Fax: 022-2282 0411; E-mail: crpd@sbi.co.in. Preliminary Examination will be conducted tentatively in the month of June 2019 and Main Examination will be conducted tentatively on 10.08.2019. Candidates are advised to check regularly Bank's website: https://bank.sbi/careers or https://www.sbi.co.in/careers for details and updates State Bank of India. Applications are invited from eligible Indian Citizens for appointment as Junior Associate (Customer Support & Sales) in clerical cadre in State Bank of India. Candidates can apply for vacancies in one State only. Candidates can appear for the test only once under this recruitment project. The candidates applying for vacancies of a particular State, should be proficient (reading, writing, speaking and understanding) in the specified opted local language of that State (mentioned in the under given vacancy table against each state/UT). The test for knowledge of specified opted local language will be conducted as a part of selection process. It will be conducted after qualifying the online main examination but before joining the Bank. Candidates who fail to qualify this test will not be offered appointment. Candidates who produce 10th or 12th standard mark sheet/ certificate evidencing having studied the specified opted local language will not be required to undergo the language test. There is no provision for Inter Circle Transfer / Inter State Transfer for Junior Associates to be recruited. 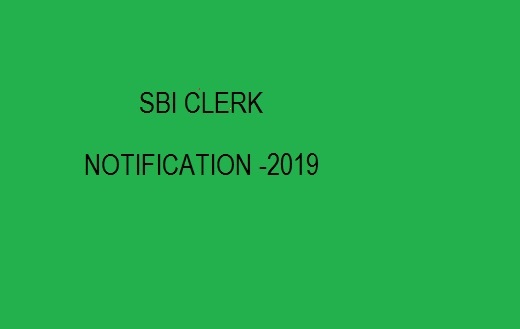 SBI CLERK NOTIFICATION, SBI Clerk Recruitment 2019 - 8593 SBI Clerk vacancies Application form, Eligibility, Dates at www.sbi.co.in.